So, we’re a third of the way into October already and my knitter friends are frantically casting off socks, turning heels and talking about fish lips whichever way I turn. All this tootsie talk got me thinking about the origins of Socktober. A quick trawl of the internet revealed that Socktober was started by Brad Montague, creator of the web show, ‘Kid President’, and his family a few years ago in the USA as an annual month-long campaign designed to show people that ordinary acts of love can make a big different – starting with socks. The idea is that by partnering with shelters and homeless organisations across the USA, those involved in the campaign can help to ensure that people living on the street have access to basic items of clothing such as socks. But, of course, with the advancements in communication, the internet and the growth of knitting sites such as Ravelry, Socktober has spread and been adopted elsewhere. While it is true that many knitters use the month of Socktober to help homeless charities such as BASH, the Brighouse and Surrounding Homeless network, others need little encouragement to pick up their needles and cast on a pair of socks, one of their favourite projects. Often, it is a great excuse to try out a new pattern or yarn or simply learn a different technique for turning a heel or finishing a toe. 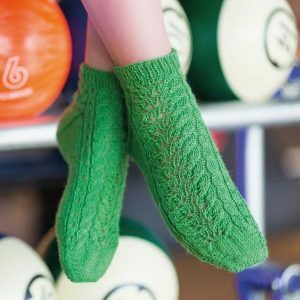 Socks, though great as gifts because they are relatively quick to knit, can also be very personal and a chance to knit something that is just for you. Until the end of the month, we are offering 10% off selected sock patterns and yarns at Baa Baa Brighouse including West Yorkshire Spinners and Sylvan Tiger Yarn. So whether you’re knitting for charity, for friends or family or for yourself, we can help to keep toes toastie!